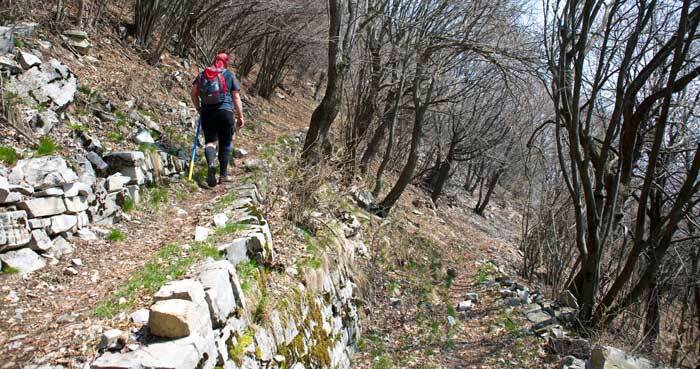 Here I describe two options for hiking to Crocione: the most direct and difficult route beginning at the foot of the mountain in Griante, and a gentler more comfortable route beginning a lot further south in the mountains above Argegno. But first, a little bit about the mountain. 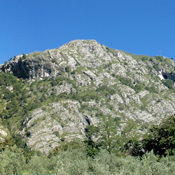 Monte Crocione, the sharp peak above Griante. Crocione is one of a series of peaks that makes up a massif, or group of connected mountains, that is bordered on the south by the Val dâ€™Intelvi, on the north and west by the Val Menaggio and Lake Lugano, and on the east by Lake Como. The massif that Crocione is part of. 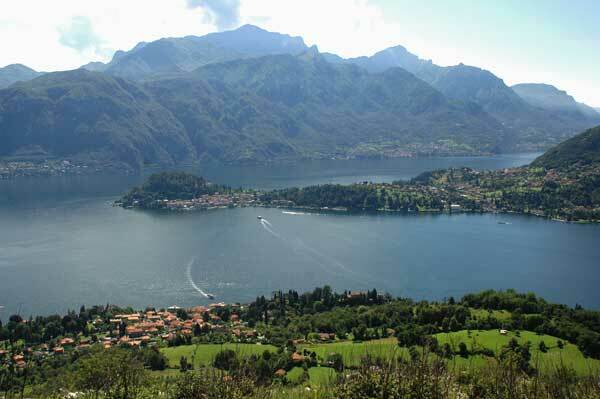 This massif is part of a larger chain of mountains called the Monti Lariani which run along the western side of Lake Como. It is the physical frontier between this part of Italy and Switzerland. 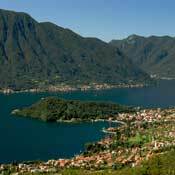 The word Lariani means â€œof Larioâ€�, another name for Lake Como. 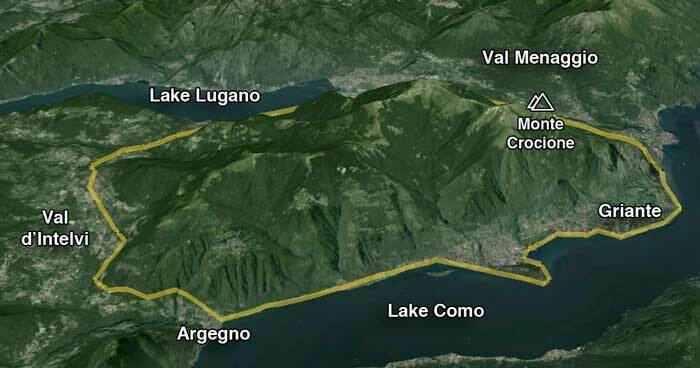 Some maps, especially older ones, name the western branch of Lake Como that runs from Como to its northern tip as Lago di Lario, while the one running from Bellagio to Lecco as Lago di Lecco. Despite the steepness of these mountains, years ago the hardworking people of this area toiled to create in them pastures for their animals called â€œalpeâ€�. Every year near the end of March when village supplies of hay ran low, a transhumance, or migration of livestock from the lowlands to the highlands began. Animals were taken to an intermediary farm or â€œmuntâ€� mid way up the mountain for a month before being sent to the higher pastures. In September the animals would return and winter in the villages. As a result, hikes in these mountains usually will have you crossing these farms and pastures, but only few of these still active, and many are being overgrown or converted into summer homes for people rather than cows! 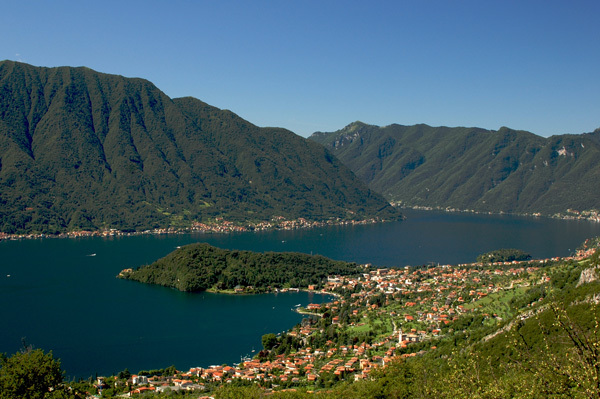 The Monti Lariani are relatively low, but they rise very quickly from Lake Como creating steep and dramatic faces that facilitate spectacular balcony style post card views of the lake below. Every point along the ridges of these mountains offers up a unique view of this picturesque lake. Every point along the ridges of these mountains offers up a unique view of this picturesque lake. When you walk in these mountains, stop to consider that for a few decades after World War II these were the mountains that local Italians crossed with contraband goods from Switzerland with 30 kg packs (a bricolla) on their backs. 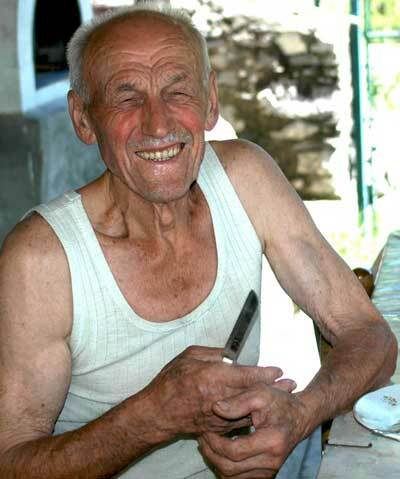 It was a hard and dangerous life, but the economies of the villages around these mountains relied on these contrabandists (the Sfrosadur) who were always trying to out run the local Italian finance police (the Burlanda). 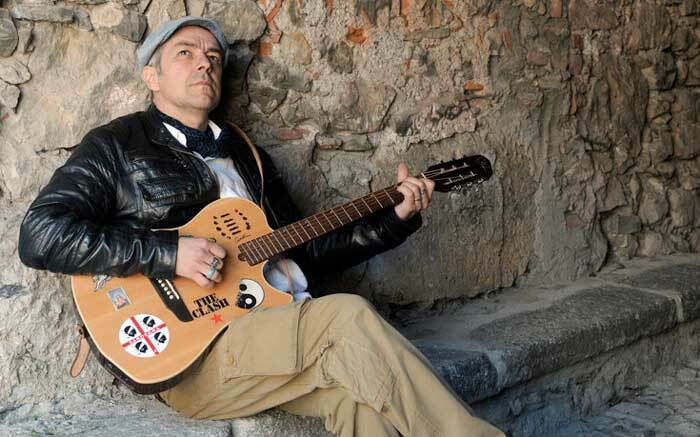 Davide Bernasconi, a musician from Mezzegra, a village at the foot of Crocione, has become quite famous internationally writing and singing songs in the local dialect, many of which tell stories inspired by these years of contraband. His stage name is Davide Van de Sfroos which translates liberally to something like Davide doing contraband. Visit his web site. 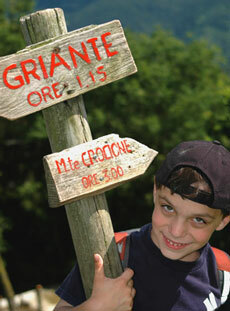 A sign in Nava pointing the way up to Crocione and down to Griante. 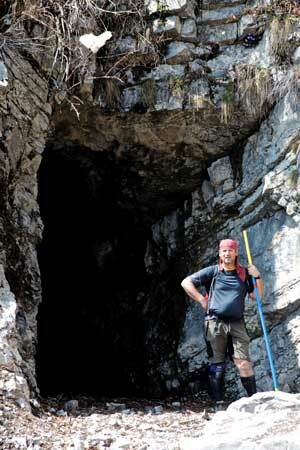 This route is about 13 kms of mostly steep hiking. It's difficult hiking, but itâ€™s not dangerous or technically challenging, so if you are fit and strong, itâ€™s not a problem. You can start from Grianteâ€™s main church â€œSanti Nabore Feliceâ€� on Via Tommaso Grossi. If you are driving, you will likely find a parking spot in front of the church. Facing the front of the church, go left. Almost immediately you will bear right onto Via Bellini so as not to walk down Via Franzani. You will then, again almost immediately, turn right up a narrow pathway called Via Brughe that will quickly take you through a steep area of forest that will then run along side a large field on your left. This area is known as Brughe. Follow the road that runs beside a few large villas then turn left towards the mountain and continue on until you get to the main road. This area is known as Rogaro. Cross the road onto a path that will take you up the first part of the mountain to the area known as Nava. The path is mostly a series of switch backs on an old rocky military road. In Nava you will find a small cluster of homes that used to be a â€œmuntâ€� or area where animals were brought during the yearly transhumance. Now it is mostly summer homes. 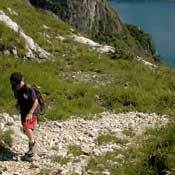 The hiking time from Griante to Nava is about 1.5 to 2 hours. Switch backs in the wooded area leading up the final approach. In Nava, Monte Crocione will tower above you. When you arrive in Nava, turn left toward Monte Crocione and continue up the mountain passing another pasture area called Brent. 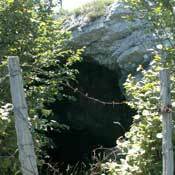 Continue hiking and you will eventually reach a tunnel that you will need to walk through. It is about 175 metres long. 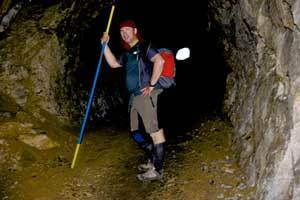 A flashlight might be useful, but is not necessary since there is a bit of light from the ends of the tunnel. 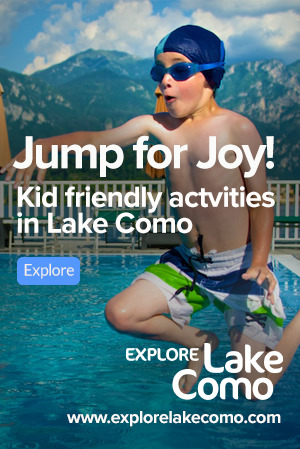 Be careful, however, because the area is rocky and usually wet. 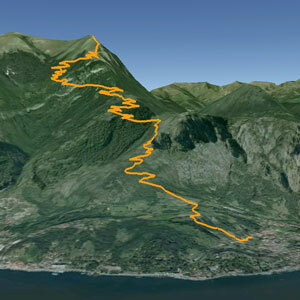 The final approach to Monte Crocione. When you exit the tunnel continue walking and you will soon get to a long series of switchbacks (about 9 of them) inside a wooded area. This will eventually spill out to a grassy ridge that will be the final approach to the summit. You should by then, or shortly after, see the cross. There will be a marked path for a bit, but after that you will need to just point yourself up and simply take the ridge to the top. 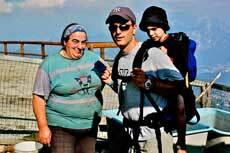 The hiking time from Nava to Monte Crocione is about 1.5 to 3 hours, making the total hiking time about 3 to 5 hours one way. From the top, you can enjoy the view then head back. 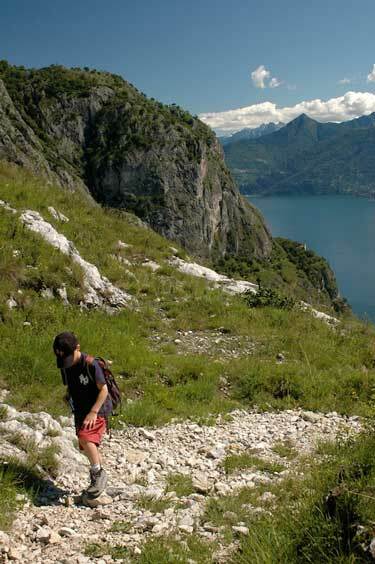 Or, you can continue along the ridge to Monte di Tremezzo (1700 m) which is actually higher than Monte Crocione, even though it does not appear to be so from the Lake. The way home is always along the same route that you took to come up â€“ avoid experimenting with your route on the way done as you will risk getting lost or ending up very far from where you started. This route is long but relaxing with only the final 100 metre ascent to the cross being a bit challenging. It takes you across a number of mountain pastures, each one named according to the village far below from which people would take their animals to graze. You will see a number of stone barns or huts, some which are still active today, as places for animals to stay or people to make cheese, and others that have been converted into a Rifuggio where hikers can stop for breaks, enjoy a local meal in the mountains, or sleep a night or two. The gently rising road that traverses the mountain side. 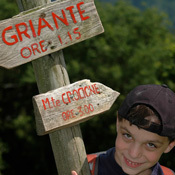 The Route from Argegno is Great for Kids! 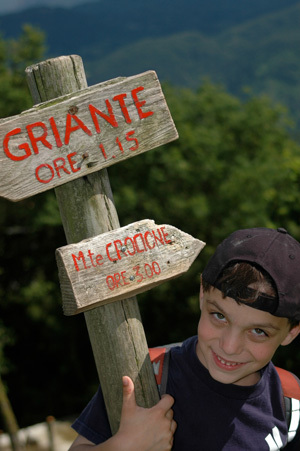 The route from Argegno up to Crocione is good for children because it is not steep, quite safe, and has almost no areas exposed to very dangerous falls. It is still, however, a very long route, so young children might get bored or not make it to the end. If your child is very young consider a carrying pack. Alternatively, rather than parking at Alpe di Colonno consider driving all the way to Rifuggio Venini and walking from there. Most of this hike is relatively flat since you will do the majority of your ascent by car. The views are equally spectacular to the route described above, if not better because you will spend more time at a higher altitude. 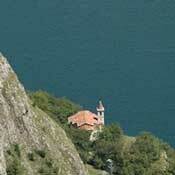 If you don't have a car, you could start from Pigra which is accessible by funicular or bus. This would mean a lot more walking, but if you stay at one of the Rifuggioâ€™s for a night, it would not be a problem at all. If you are a fit mountain biker you can also get to just under Crocione by mountain bike. Just combine the driving and hiking directions below with a good set of legs. 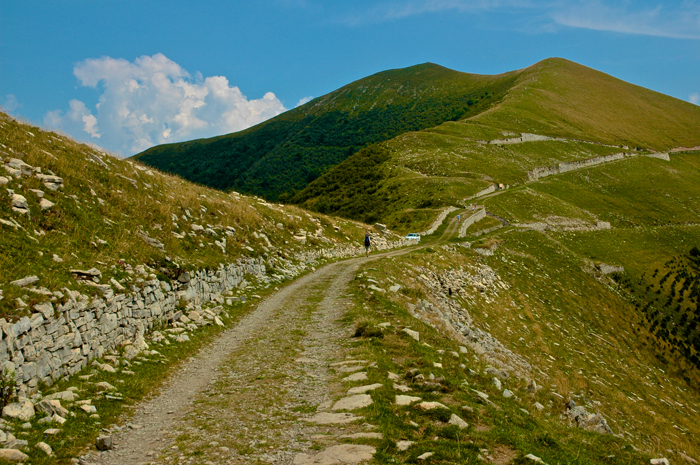 I recommend driving to the Alpe di Colonno via Argegno and starting your hike from there. 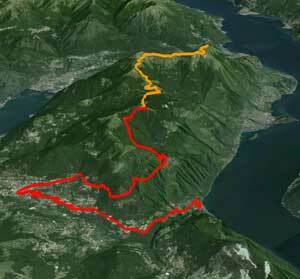 You can drive as far as the Alpe di Lenno and even all the way to the Rifuggio Venini along the road described below for walking. Immediately north of Argegno on SS340 (the road that runs along the lake) is a road that goes to the Val d'Intelvi and the towns of Lanzo and San Fidele. In San Fidele find and follow the signs for the road to Pigra. This road becomes narrow and runs along the side of the mountain. It may not seem possible, but there is a bus (C24 San Fidele) that travels on this narrow road! 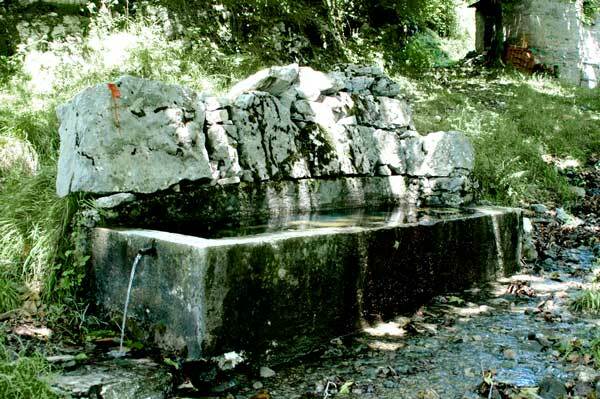 Just before you reach the town of Pigra you will take a road rising to the left with a sign that reads â€œVallaggio Alpino Pigra, Alpe di Colonno, Buffaloraâ€�. This road will wind through the town a bit and then very quickly turn into an old ex-military stone road that runs along the side of the mountain, slightly rising, with the Val Camoggia on your right side. 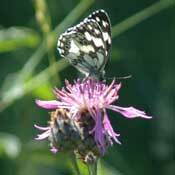 After traversing the valley you will end up at Alpe di Colonno, a pasture directly above the town of Colonno. There is a rifuggio there called Ristoro Alpe di Colonno. This is a good place to park your car and start hiking. 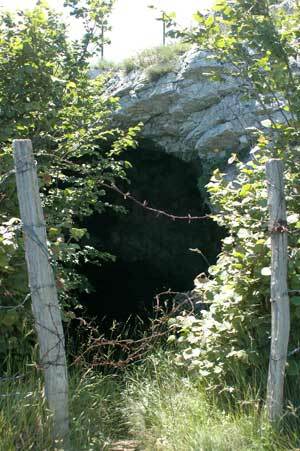 From Alpe di Colonno you will continue on foot along the small and narrow military road that you drove in on. 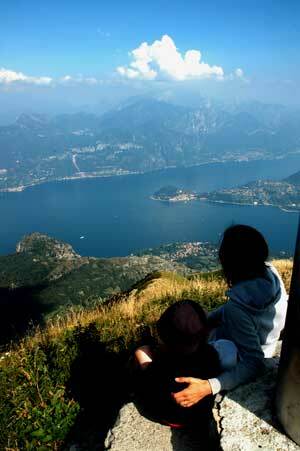 It will descend slightly down the opposite side of the mountain massif facing Lago di Lugano and Prolezza to another rifugio called Rifugio Buffalora. 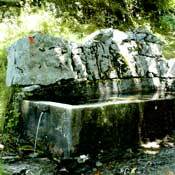 You will see there a large watering hole (Abbeveratoio) for animals. 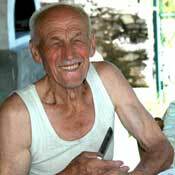 From Rifugio Buffalora you will continue on the road which will dip down briefly then quickly rise again at a small chapel. At this point make sure not to go left and down the mountain to Ponna. 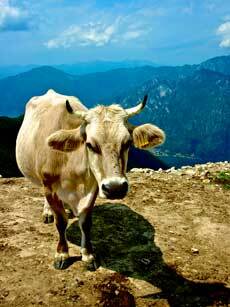 You will pass through the Alpe di Ossuccio which has a mountain hut for animals and a place to buy cheese. From the Alpe di Ossuccio the road will wrap around the mountain bringing you back to the east side of the mountain. The road will rise gently as it traverses the side of Monte Galbiga with the Val Perlana and Lake Como on your right side. 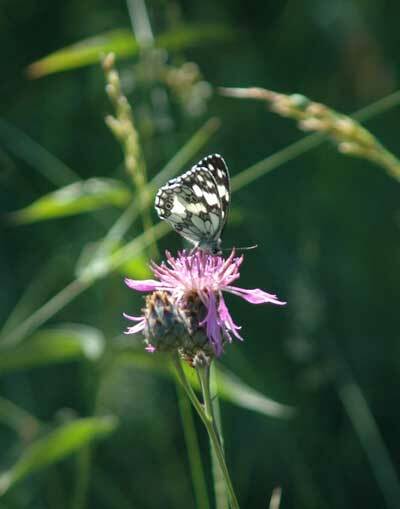 You will arrive at the Alpe di Lenno where again you will find a mountain hut for animals, a place to buy cheese, and a watering hole for animals. You will be on the ridge of the mountain so you can walk behind the mountain huts for a view over the other side of the mountain. 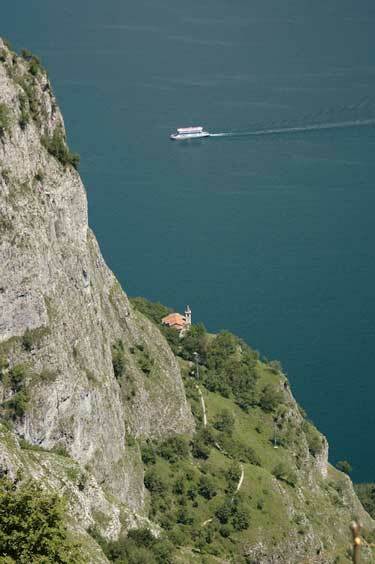 Lago Lugano will be almost directly below. Continue walking and traversing Monte Galbiga with the Val Perlana still below and you will get to Rifugio Venini Cornelio (1576 m). It too is on the ridge, and it will quickly come into view as you hike the road. From Rifuggio Venini continue along the road. You will arrive at some old military fortifications and trenches from the early 1900s that we're part of the Linea Cadorna defences. At this point you can opt for a short diversion to summit Monte Tremezzo which at 1700 metres is actually higher than Monte Crocione, or you can traverse the side of this mountain which will bring you around to the Alpe di Mezzegra where you will find another group of mountain huts. Continuing along the road you will finally see your destination in the distance, Monte Crocione, which is the last of the peaks on the massif youâ€™ve been traversing. 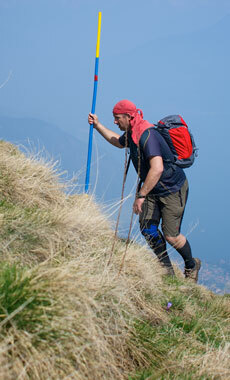 From here the simplest way up is to stay high on the ridge and walk to the summit. You will again pass some fortifications from the Linea Cadorna just prior to the final approach to the summit where you will find a very large steel cross. 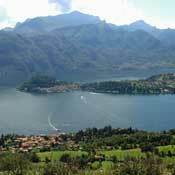 Rest and enjoy view over virtually the entire Lake Como including the northern part of the lake.